Happy Friday babes! Hope you had a great week and have some fun weekend plans ahead. This weekend we have family that will be in town so that's going to be most of Saturday then Sunday I am planning to devote to getting caught up on blog stuff! The weather is supposed to be gorgeous all weekend so I'm hoping I don't get rained out of any outfit shoots like last weekend. 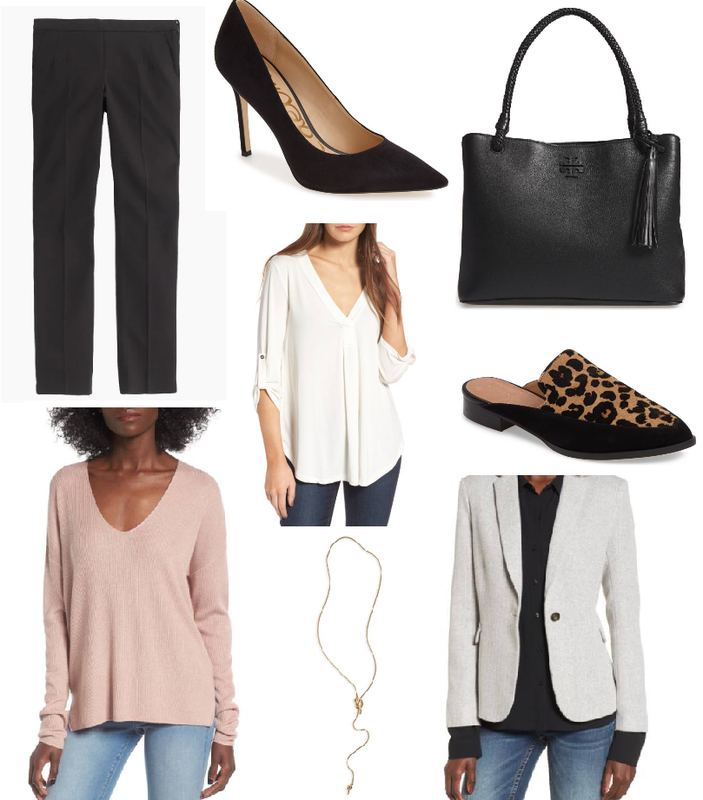 This post is for those of you that work in a corporate office setting and need some outfit inspiration! My office is sort of a mixture of casual and professional so for the last 2 years I've really leaned more on the casual side. This year one of my silly resolutions was to start dressing more like an adult haha especially at work! Even though I have the option to wear jeans I've been trying to dress a little more business professional over business casual. These pants from J. Crew are my absolute FAVORITE. They're super slimming and look very tailored without actually being tailored! I also have to have a good collection of blazers because I love wearing them to work but also dressing them down with jeans. I think having a great, professional bag makes any work outfit look super chic. I just got this Tory Burch bag but in the "soft clay" color and it is just the perfect bag. Last year I used my TB Perry Tote a ton too! This summer I also invested in a Goyard tote because I found it slightly reduced on Ebay and I've been wanting one for a while. While I do LOVE it especially for work and travel, I know it's not as affordable. I think Tory Burch is a great price-point and so classic. Ok so I have been wanting to start a new series on my blog just because I've been feeling a little un-inspired by always talking clothes on here. As some of y'all might know, I work in Human Resources/Organizational Development by day so I really wanted to incorporate some of my knowledge on career advancement, interviewing/job hunting, staying organized/motivated, and since this IS a fashion blog, dressing for success of course! Let me know what you guys think of the new series and any topics you might be interested in learning more about! I love all those picks. They are very good for work. I bet you are the prettiest girl at work!!!! I love all these workwear picks! I'm starting at a new internship next week and I'm trying to shop for some good casual-officewear pieces this weekend. Love the loafers! I love your picks, they look amazing! Thanks so much for sharing your suggestions, girlie! I've just added that black tote to my wishlist because I really need an all black one without any hardware, so this is PERFECT! I have a black TB one that has some gold in it and it bugs me the way it looks when paired with a leather jacket that has silver details. I also need those mules in my life, which I passed up during the sale and regret. Thanks again and I hope you have a great weekend! Sounds like a fun series! Loving these pieces for work. Enjoy the weekend! Lovely picks! I love the black bag, it's simple yet elegant.